Message: Be watchful! It might happen. Heck, you might be there already. The last half of 4th quarter is teacher burnout time. The kids get crazy, patience is lost, and that reserve adrenaline has already been drained from your weary body. There are days you just want to scream into your pillow. Or pull your hair out. Or flop on your couch at home. You get the picture. The school year is like a marathon, and if you have ever run a marathon, this may be the point—at mile 23 or 24—where you hit the brick wall. You have nothing left! Where do you get that energy to finish strong? Where’s the passion? How do you even survive? I was reminded of this thought at a professional day meeting last Friday morning. Utilizing Zoom, a new face time program that our district is purchasing for our iPads, we connected with Sarah Brown Wessling, an ELA guru who happened to be traveling in California. She told the story of a marathon she ran about a year ago. Now, every marathoner has a playlist to push you through. The perfect song to get you through that extra mile. Her family and friends could not be there, so she had each one create a playlist of three songs. Having not even listened to the songs they chose, she memorized their names and the order in which they came. And each person was on her heart, running alongside her, until she broke the tape to finish. Take your classes outside for a treat. If the weather is nice and you don’t need your classroom, why not enjoy the beauties of nature around you? Create an iMovie that features your students to show them on the last week. Kids love memories, and they love their friends! I am in the middle of creating one right now that makes me smile, and I know the kids will love it even more. Write a personal note to each student before they leave. My notes have already been started because I know things get hectic those last few weeks. They will love you for it! I have students from over 10 years ago that have kept their notes. Those encouraging words will be priceless. Play music! Last week I needed a little pick-me-up between classes, so I was playing “Everybody Dance Now” from C&C Music Factory. My kids thought I was crazy as I was doing the running man in the middle of my classroom, but many joined in, and it became a dance party! Create challenges. This is a great way to provide incentives—especially if the reward is something the students will work for. Free seating, a class party, you name it! Let their competitive nature push them through the last month, providing positive peer pressure. Ever heard of escape rooms? Create one for your students! I am going to tweak my Outsiders Escape room after we finish our novel. It should be even better than last year’s, and I know the students will love solving the puzzle. Have students write kind descriptions of each other and give them to each child. Those words get laminated on small bookmarks for my students, and I always love adding my own words as well. Sometimes a kid struggles seeing their brilliance unless it is brought to their attention by outside caring eyes. Give your final exam early and make the last few days a celebration! The last three days I give each student personalized gifts (my note, words of kindness from other kids, and their letter to their end of the year self) and shower each kid with praise. Bittersweet tears of joy have been wept every year. Most from yours truly. Tell stories that reveal life lessons. Two weeks ago there was cheerleader drama over little silly things. I told each class the story of how my best friend and I had an all-out yelling match when his girlfriend accidentally spilled my Cool Ranch Doritos in college. By the end of the day, they all knew not to fight over silly things like spilled Doritos. Look for ways to laugh and have fun. Tell jokes. Play a funny YouTube video. Revolve these around your students’ interests, and you are sure to get bonus points. If you are laughing the last month of school, that will provide the energy you need. There you have it. 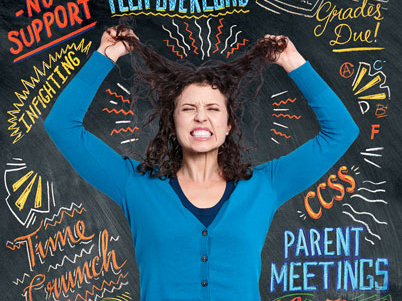 Ten ways to crush teacher burnout and motivate your students, not to mention yourself. I am excited to try some of these myself, but do you know what would be cool? This blog is going out to so many readers out there. What if YOU had an idea that you wanted to share with others? Reply back below. Share your wisdom with others! Let’s make this week’s blog an interactive experience that will power us ALL through the last month. Share it with a colleague. This is good applicable stuff that we all can benefit from! May the Lord guide us all to navigate the last month to make a difference. Challenge: Take your favorite idea from above and apply it to a lesson this week. Video application: Nothing says finishing strong like the video of Derek Redmond at the 1992 Olympics. Let this video inspire you to finish strong as well. Journal/Accountability: Write or talk with a trusted Christian friend to brainstorm ideas on how to motivate yourself and your students the last month of school. Bible story: Read John 9 about Jesus healing a blind man. How does the blind man show enthusiasm? How would you respond if you were in his shoes? Prayer: Father, it is such a blessing to make a difference as a teacher! Fuel me with your power to motivate my students to finish strong. Amen.